It is important to set both outcome goals and process goals, and especially to know the difference. Think of process goals as actions, or habits. Collectively, you expect actions and habits to lead to a desirable end result. But initially your goal will likely be to simply develop the habit itself! Once you have the habit down, that's when you'll turn your focus to the end result, or the outcome, those habits are intended to produce. Example of a process goal: getting into shape. When you begin working toward the goal of "getting into shape" you likely need to get into the habit of eating better and exercising more. So a process goal might be, “For the next three months, I am going to exercise three times a week for at least 45 minutes each time. Additionally, I will eliminate all snacks and sweets from my diet.” The goal is measurable and time-bound, but there is no specified outcome – no amount of weight lost or muscle gained. 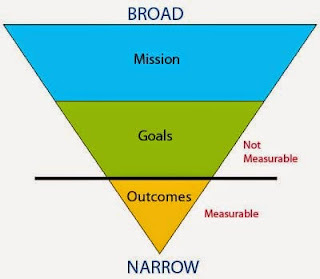 Outcome goals almost ignore the process - the main thing that matters is the outcome! Example of an outcome goal: losing 10 pounds. You're less likely to say how you intend to achieve your goal, certainly state exactly what your desired outcome will be.